In this article, we will show you, How to Format Line Chart in Power BI with example. 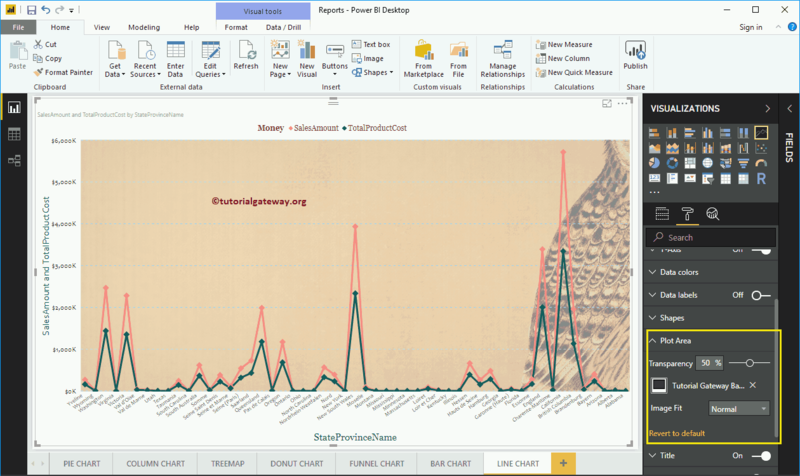 This includes changing the Line Colors, Title text, Title position, Axis Details, Data labels, and background Images etc. To demonstrate these formatting options, we are going to use the Line Chart that we created earlier. Please refer Power BI Line Chart article to understand the steps involved in creating a Line chart. 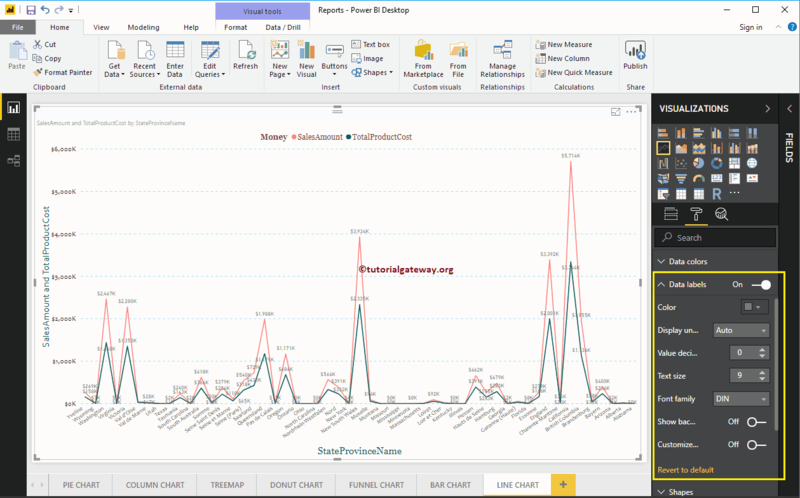 Please click on the Format button to see the list of formatting options that are available for this Line Chart. To display or enable the Legend, Please select the Legend region and toggle the option from Off to On. Use the Position drop down box to change the legend position. As you can see from the below screenshot, we added the Legend Title as Money, Legend Position as Top Center, Color to Brick Red, Font family to Georgia, and text size to 20. Following are the list of options that are available for you to format the Horizontal axis or X-Axis. As you can see from the below screenshot, we change the Color to Dark Grey, Font style to Candara, Text Size to 12. By default, X-Axis title is set to Off but you can enable it by toggling Title to On. Let me change the Title Color to Green, Font style to Georgia, and Font Size to 20. Following are the list of options that are available for you to format the Vertical axis or Y-Axis. 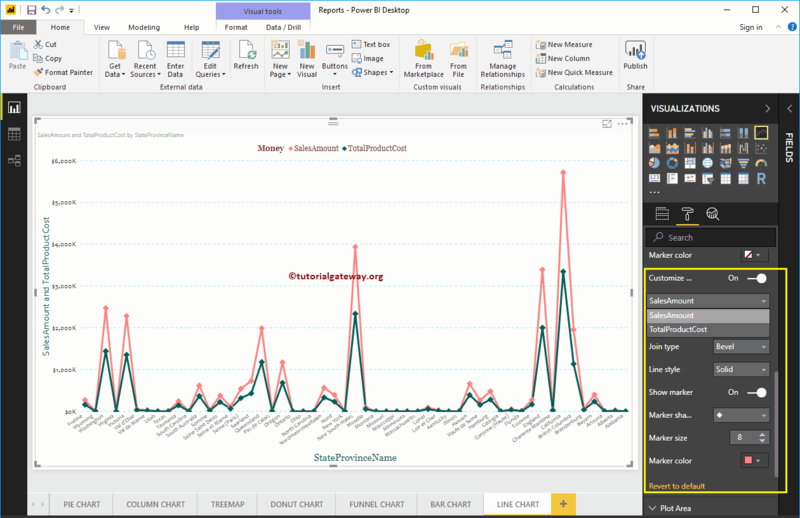 You can see from the below screenshot, we change the Y-Axis labels Color to Dark Grey, Text Size to 15, Font style to Candara. Let me change the Scale type to Log. From the below screenshot, you can see that it is displaying the Log scale. By default, Y-Axis title is set to Off, but you can enable it by toggling Title under the Y-Axis section to On. Let me change the Title Color to Green, Title Text Size to 20, and Font family corbel. By toggling the Gridlines option from On to Off, you can disable the Grid lines. Color: You can change the Grid lines color. Stroke Width: Use this to change the Grid lines width. Here, we changed the width from default 1 to 2 strokes. Line Style: Choose the line style such as Solid, dotted, and dashed. By default, Line chart will display with default colors. Let me change the Sales Amount Line color to Brick Red, and Total Product Cost color to Green. 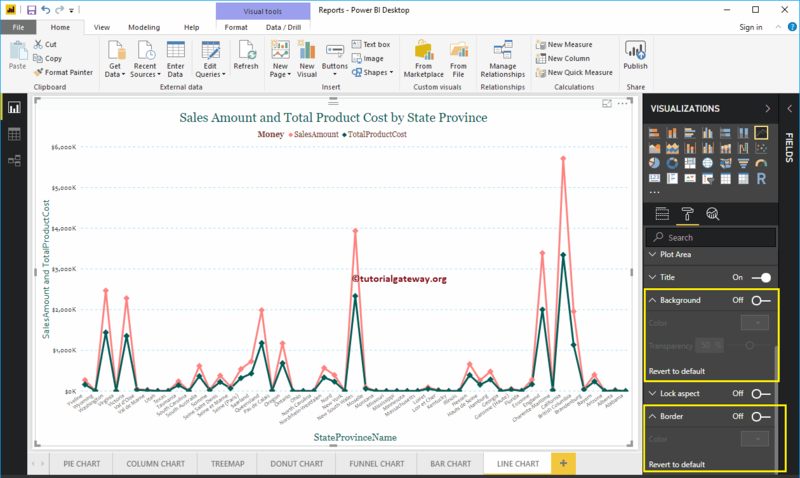 Data Labels display the Metric or Value information (Sales Amount at each point) about the Line. I don’t think see require a Data Labels for the Trends but you have an option. As you can see from the below screenshot, we enabled it to display the properties. Use this section to change the Line Strokes, or joining. As you can see from the below screenshot, we changed the Stroke Width (Line width) to 4, marker Shape (Shape at the joining Point) as Diamond, and Marker size as 8. Whatever the changes you make in the above step will reflect on both the Lines. But, you have an option called Customize Series and if you enable this option, you can customize individual Line. You can add Images as the Background of a Line Chart using this Plot Area section. For the demonstration purpose, we added one image as the Plot Area Background. By toggling the Title option from On to Off you can disable the title of a Line Chart. 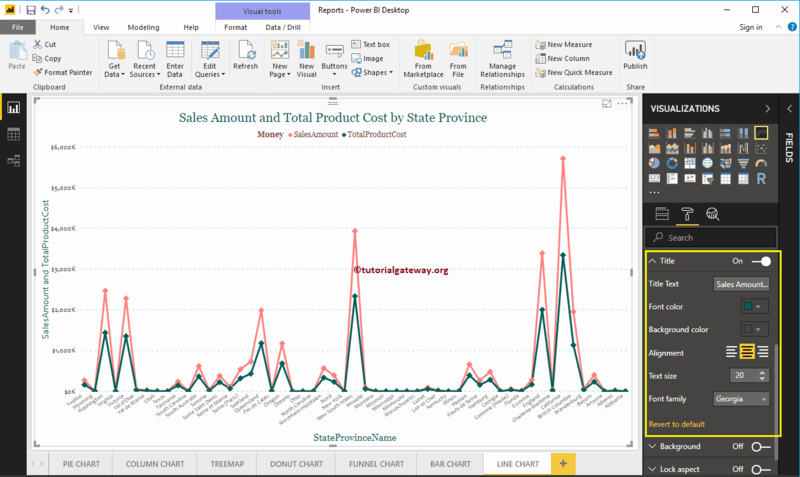 As you can see from the below screenshot, we change the Title Text to Sale Amount and Total Product Cost by State Province Name, Font Color to Green, Font Family to Georgia, Font Size to 20, and Title Alignment to center. If you want, you can add the background Color to the title as well. You can add Background color to a Line Chart by toggling Background option to On. 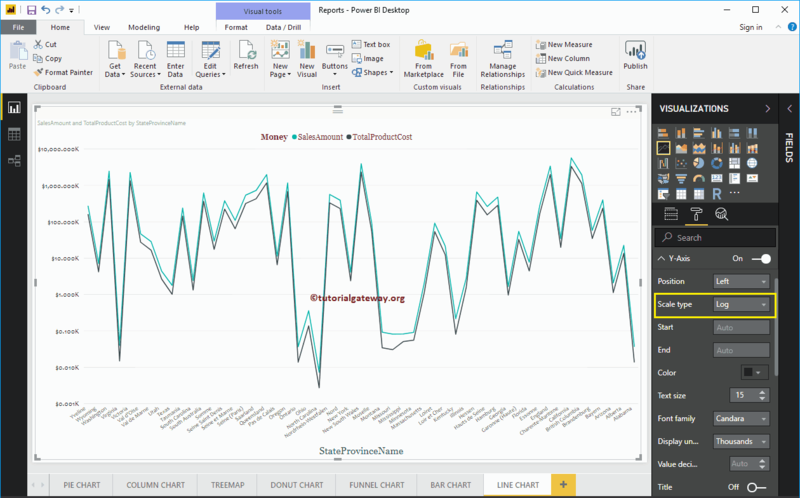 And, you can add Borders to a Line Chart by toggling Border option from Off to On.